At Les Iffs, between Rennes and Dinan, the Château de Montmuran is a place full of history. Take a guided tour and travel through the centuries, from the middle ages to modern times. 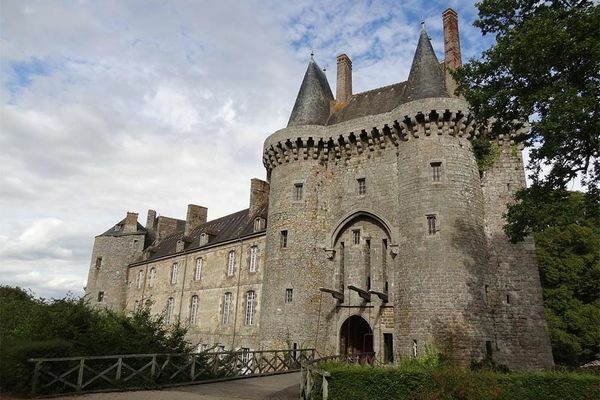 Located at Les Iffs, between Rennes, Dinan and Saint-Malo, Montmuran is an imposing château. It overlooks the surrounding countryside and is actually a 'two-in-one' château/castle. It was built in the 12th and 17th centuries, reshaped in the 18th century and combines medieval and classical styles. To bring this heritage to life, the La Villéon family offers interesting guided tours, sometimes in costume. These are lively tours, accessible to everyone, which give you an introduction to the château's architecture, defences and history. First, you'll discover the defensive keep, with its authentic drawbridges, towers and moats. Then, in the central part, is the guardroom and its small museum that retraces the history of the successive owners through their coats of arms. Here, you can also see the famous oubliettes: trapdoors with a drop of 30 metres. In the chapel, a stained-glass window tells the story of Bertrand du Guesclin who was knighted there. To finish up, how do you feel about climbing the 60 steps that lead up to the parapet? From there it's said you can count over 20 church steeples. Why not go and check?